I want to home-cook for my dog! A holistic veterinarian’s guide on how to do it and keep your vet happy! This is a blog post that is near and dear to my heart. I truly believe in providing whole food nutrition for my canine patients. I must say that there are MANY opinions out there on home-cooking and, like most people, I have my own opinion. Through this blog I hope to provide you with a clear idea of how I think you can home-cook for your pet in a safe and healthy way. You may also be able to keep your veterinarian happy in the process! It’s true that many vets are wary of home-cookers. They fear the diet is not safe or balanced for long-term feeding. Luckily, because cooking for our pets has become so popular, there are now some simple ways to make sure your diet is complete! Some also worry about the bacterial risk with home-cooked diets, so I do always recommend gently cooking the food (more below). I am a veterinarian trained in Traditional Chinese Veterinary Medicine. I am a certified acupuncturist and herbalist for animals. I also have a certification in veterinary food therapy, so I have some additional training on how to home cook for your pet. That being said, I am NOT a veterinary nutritionist and I don’t claim to be. This blog is aimed at cooking for a healthy dog. If your dog has a serious medical condition and you wish to cook, I would refer you to a board certified veterinary nutritionist who can develop a specific diet plan tailored to your pet’s needs. I do this for my own patients as well. Many commercially available “kibble” diets have a high glycemic index, which may trigger inflammation in the body and fuel neoplastic conditions, some of the most common conditions in our canine companions. Any fish oil added to the diet is usually rancid due to the cooking process and exposure to oxygen, making it pro-inflammatory. Also, the micronutrients and antioxidants are destroyed in the cooking and drying process. There is some preliminary research to suggest that kibble diets have more heterocyclic amines, a known carcinogen. There are also the potential risk of GMOs, 3D and 4D meats (dead, diseased, downed and dying animals). Home-cooking can eliminate these risks and may even help your pet live longer. Research on this is currently underway. I recommend a gently cooked diet made of organic muscle meat, organ meat, whole grains and seasonal local veggies. I suggest rotating ingredients and supplementing with balanced vitamin/mineral supplement designed by a veterinary nutritionist and a calcium supplement. The most common clinical nutrient deficiencies seen in dogs eating home-made diets without balancing are taurine and calcium deficiency. I also recommend a source of linoleic acid and fish oil. Without these skin problems can develop. I do NOT recommend raw feeding, and again, it is just my opinion and I may now have a few of you running from this blog. Chinese medicine believes that raw or “cold” food damages the digestive tract over time and can lead to chronic health problems. Also, research does show that raw feeding can cause a dog to shed harmful bacteria, which can potentially be passed to people in the home.1 My goal is to keep your dog safe, but you and your family safe as well. I believe that dogs have genetically evolved to become scavengers, and as such their digestive systems can handle cooked veggies and whole grains. Even African Wild Dogs will eat the intestines of their prey first, which contain partially digested plant matter. I also think organ meats are also essential to the diet of dogs and we are depriving them if not feeding them. There are really 2 different options for safe and balanced home-cooking. This website was designed by a veterinary nutritionist to help owners and veterinarians create and balance home-cooked diets for their pets and patients. When you go to the website hover over the Homemade Food icon on the left, then click on FREE Autobalancer EZ (not the one for vet patients). You don’t have to have an account to create recipes. You choose your meats, grains and veggies and it spits out recipe options in perfect daily proportions for your dog’s weight. You can multiply everything by 7 to get a week’s worth of food. I like the high protein or mid protein recipes provided. There is little room for adjustment as proportions have to be exact, no substitutions are allowed and organ meats are not options. You have to buy the recommended supplement (listed in the recipe) or it won’t be balanced. You can create several recipes, though, for rotational ability. There is also a meat only option. I do think this is an easy way to do it and it is very exact in terms of nutrients and calorie balance. This way is preferred by a lot of veterinarians and is used by many veterinary nutritionists. I have used it with many of my own patients. This provides a large quantity of food that can be portioned out and used for meals throughout the week. You have more flexibility with ingredients and proportions, but it’s not as exact. Cooked food is good for a week in the fridge or can be frozen in meal portions and de-frosted if you have a larger quantity. You want about 1/3 meat, 1/3 grains and 1/3 veggies by volume once the food is cooked. 1/10th of the meat by weight can be organ meat (the rest should be muscle meat), which provides extra taurine, vitamins and micronutrients. It will take some practice to get the proportions right because depending on the grain you use it may increase in volume quite a bit when cooking and a lot of veggies will decrease in volume. I also add about 4Tbsp of an oil high in linoleic acid (walnut, canola, safflower, sunflower are all appropriate) to the crock pot. If you are using grains and veggies tend to get mushy you can always cook them separately and add them to the pot at the end. I add fish oil (Just Food For Dogs has a great one) and supplements to the food just before feeding. 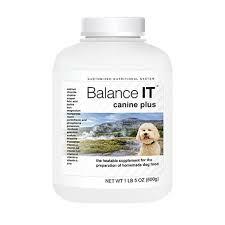 The 2 supplements I use are designed by a veterinary nutritionist, and you need both for the diet to be balanced. 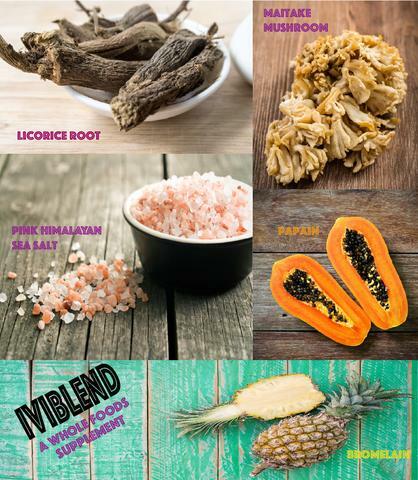 Iviblend is the vitamin/mineral supplement and TerraCal is the calcium supplement. Just dose according to label instructions. They are designed to supplement rotational home-made diets so that they are as complete and balanced as they can be. Feeding the appropriate amount of calories is very important as research has shown that dogs who are an ideal body condition (see here where your dog is!) live at least 2 years longer than overweight dogs! The calculator below provides average calorie needs for your dog. Some dogs require more or less. You can see how many calories you are currently feeding in your kibble by looking at the bag for kcal/cup. If your dog is maintaining an ideal body weight on this amount of calories then go with this number. You can calculate your dog’s average calorie needs by using this online calculator. 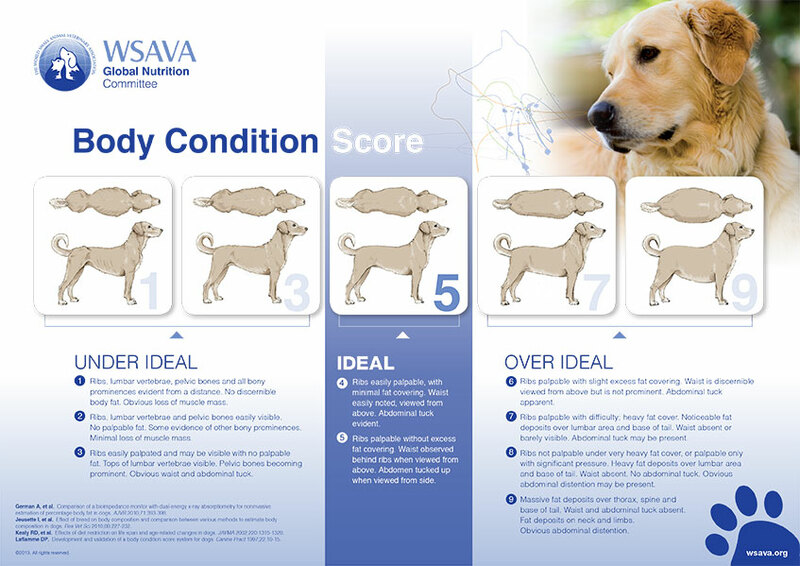 Make sure to choose your pet’s ideal body weight and the appropriate description under activity. If your pet needs to lose weight you can use the calorie requirement for weight loss. If your pet is already it’s ideal body weight then use the recommended calorie requirement. You can easily figure out how many calories are in your whole crock pot by google searching the calories of all the ingredients based on the amounts you used and add it all together. Make sure to be specific in what types of ingredients you used. Then you can see how many cups of food you made and figure out how many calories are in each cup but dividing the total amount of calories in the crock pot by how many cups it made. Then you’ll know how many cups to feed your pet a day based on their daily calorie needs and you can split that into 2 feedings for the day. Is there anything you shouldn’t feed? It’s controversial, but just for safety’s sake, and because you may be doing long-term feeding, don’t use garlic or onions. They can be toxic to dogs when given on a consistent basis or in large quantities. Grapes and raisins are also potentially very toxic to a dog’s kidneys, so just don’t use them. I usually only feed fruits as treats anyway, because they have a lot of sugar when using as a main ingredient in a diet. Berries make great treats! There is also some new information out there that diets which include peas, potatoes or legumes may be causing a certain type of heart disease in dogs called Dilated Cardiomyopathy. Please see more information on this at my blog here. For now, until we figure out what is going on, I’m recommending to NOT include these ingredients in your home-made diets. There are PLENTY of other ingredients to choose from. Please remember that if you are going to switch to a home-cooked diet you need to do it GRADUALLY. Recent research is showing that a dog’s gut microbiome is different if they eat kibble vs. home-cooked vs. raw. So when you are changing foods you need to go slow with your dog and give their gut time to adjust. This will help prevent issues like diarrhea. I like to do 1/4 of the new diet and 3/4 old diet for 3-4 days, then 1/2 and 1/2 for 3-4 days, then 3/4 new and 1/4 old for 3-4 days and finally all new! If your dog has a sensitive stomach take longer to transition. Also, adding in a probiotic prior to the change can be helpful. I like www.visbiomevet.com or any human probiotic with >8 strains and >50 million cfus which is made by a reputable company. I really hope this blog has been helpful and that it will get you started on a safe and healthy path to home-cooking for your best friend! As always this is just a guide. For more specific information or a specific diet plan tailored to your pet’s needs you can discuss this further with your holistic veterinarian or schedule an individualized consultation by contacting my office. National Prescription Drug Take Back Day - April 28, 2018! People are just starting to understand the impact that discarded pharmaceuticals and personal care products have on the environment. In a recent survey from Oregon State University, 191 pet owners were surveyed and almost 50 percent placed unused veterinary care products and medicine in the garbage. PPCPs (pharmaceutical and personal care products) are used by almost everyone and most wastewater treatment plants are not able to completely deactivate many of the compounds they include. Chemicals from PPCPs for people and pets are being found at low levels in groundwater and surface water; anti-inflammatories, antidepressants, antibiotics, estrogens, insect repellant, antimicrobials, and sunscreen compounds are among what’s being detected. We need to do our part to dispose of these items properly! Whenever possible PLEASE take your unused or expired prescription drugs into a facility that can do this. In Napa, CA the Coroner’s office at 1535 Airport Blvd collects prescriptions drugs YEAR ROUND AND FREE OF CHARGE M-F 8AM-4:30PM at the front counter. No need to call ahead of time, you can just bring them in during those hours. If you are not located in Napa County then you can check this website for collection sites on April 28, 2018 (National Prescription Drug Take Back Day) and click on Locate a Collection Site Near You. Many cities create prescription drug take-back events on this day and post them here . If you are unable to bring your prescription drugs to a site that will dispose of them properly then please read this informational guide put together by the Environmental Protection Agency about how to dispose of these products at home. There are very specific instructions here. This is of course not recommended unless you are absolutely unable to bring them to an appropriate facility. Thank you so much for reading and please do your part to help our environment! Prevent Pet Poisoning! How to keep your best friend safe. Although this is a cute picture chocolate can be very poisonous to dogs! Always remember to keep it away from your furry friend. Read below for more info and a free chocolate toxicity calculator! At Napa Valley Holistic Vet we want to help keep your pets safe and healthy! Preventative medicine is a cornerstone of holistic pet care. We want to help you prevent your best friend from getting sick if at all possible! In honor of Pet Poison Prevention Week we have put together a guide to help keep your pet safe from common poisons around your house. First we must say that the ASPCA Animal Poison Control Center does an amazing job. If you suspect that your pet has eaten something toxic you can call 1-888-426-4435. 24 hours a day, 7 days a week, 365 days a year. They have veterinarians on staff who can help you decide what you need to do and if you need to take your pet to the veterinarian. They do charge a $65 consultation fee but it is well worth it and often cheaper than a veterinary visit if it can be avoided! The Animal Poison Control Center also offers a free mobile app with a wealth of information about different potential pet toxins. You can access more information on it here . Another great tool they have is a list of toxic and non-toxic plants for pets! If you think your furry friend has eaten a plant, just look it up online to see if it could be poisonous. This is free and easy accessible here. The Poison Control Center received 199,000 calls in 2017 alone regarding potential pet poisonings. This number was up from last year which goes to show that we need to be better educated about keeping our pets safe from these potentially deadly toxins. If you suspect your pet has ingested a poison you can call the APCC at 1-888-426-4435 to see how serious it is. However if you know they got something poisonous then you should take them directly to your veterinarian. The sooner the better because if the ingestion was within 3 hours vomiting can often be induced which will save you lots of money and potentially save your pet’s life. Your pet may also be given activated charcoal to bind any toxin that remains in the stomach after vomiting so they won’t absorb it. 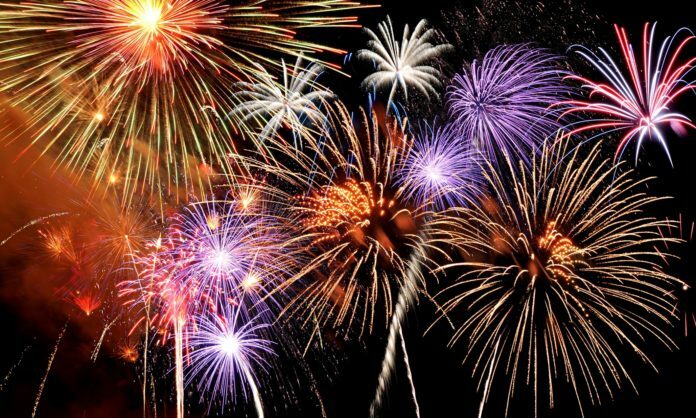 The top 10 poisonings of 2017 were…..
10. Garden Products - Pets often find fertilizers and compost irresistible. 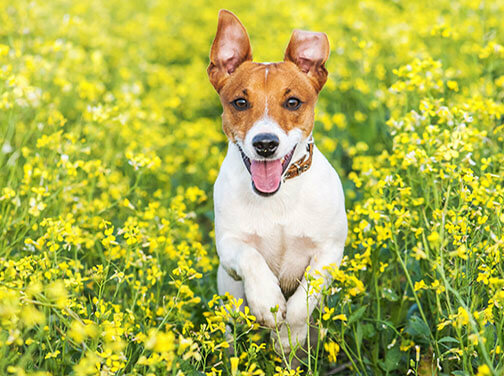 Fertilizers often cause GI upset and if the compost or fertilizer is moist and growing mold your dog may develop serious tremors from ingesting them. So it’s best to keep these products where dogs can’t find them and keep your dog inside or confined in a separate area of the yard when you are working in the garden. 9. Plants - Many plants can be very toxic to our furry friends. Lilies are deadly to cats and Dr. Kim recommends never keeping them in your house if you have a cat. The same goes for Sago Palms and Oleanders if you have a dog or cat. If you aren’t sure a plant is safe for your pet you should use the Animal Poison Control Center’s online site to look it up - remember it’s free and can be accessed here. 8. Rodenticides - These rodent poisons are potentially deadly to dogs and cats. They should be kept out of reach of pets at all times. If you suspect your pet has ingested this they should be taken to the veterinarian right away. 7. Insecticides - Insecticides and herbicides are also potentially toxic. So it’s best to keep these products where dogs can’t find them and keep your dog inside or confined in a separate area of the yard when you are working in the garden. 6. Household Items - The APCC lists paint, glue, cleaning products and laundry detergent as potential dangers. Gorilla glue is very toxic to pets because, if ingested, it expands exponentially in the stomach and hardens. Vomiting cannot be induced and surgery is required to remove the large “ball” that forms. Very scary! Also laundry pods are posing a new, potentially fatal danger to pets. You can read more about this here. 5. Chocolate - This is a very common toxicity with our furry friends, especially dogs. Dark chocolate and baking chocolate are more toxic than milk chocolate. In sufficient amounts they can cause GI upset, seizures, cardiac arrhythmias and even death. 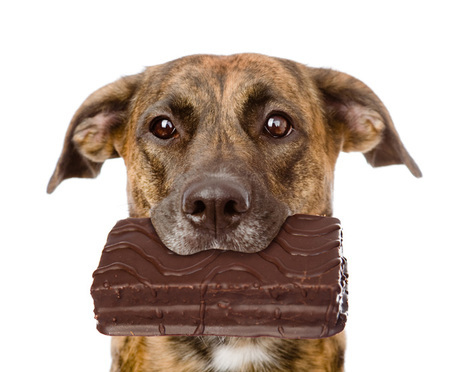 If your dog has ingested chocolate you can use the chocolate toxicity calculator here to see how dangerous the type/amount was. 4. Veterinary Products - This includes the flavored and chewable medications that we give to our pets for pain relief as well as parasite prevention. Dogs have been known to eat entire boxes/bottles and can get VERY sick. Make sure to keep these medications out of reach of your furry friends. 3. Food - Common toxic food items include chocolate (see above), grapes/raisins/currants, garlic, onions, macadamia nuts, alcohol, unbaked bread dough, alcohol and products containing xylitol. Any amount of grapes or raisins could be deadly to your dog causing kidney failure if he/she is sensitive. A small amount of garlic or onion isn’t a big deal in a large pet but if they are cooked down in a dish or concentrated powders are used then we get concerned about blood disorders. Also if your pet is very small then a small amount could be a big deal. Xylitol is an artificial sweetener that is very common in gum, toothpaste, candies and sugar free baked goods. 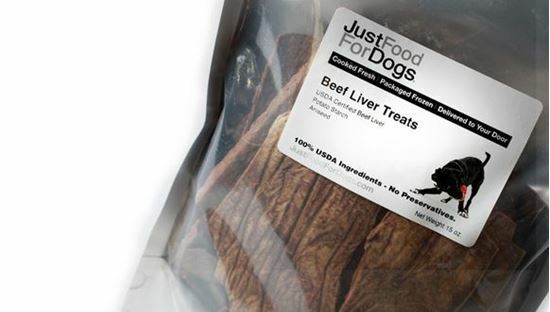 If ingested it can cause low blood sugar and irreversible liver failure so make sure to keep all of these products FAR away from your dogs (check your labels)! Even a small amount of grapes can cause kidney failure in dogs and we don't know what makes some dogs more sensitive than others! Better to be safe than sorry! 2. Over-The-Counter Medications - Including but not limited to pain medications (ibuprofen, acetaminophen and naproxen), vitamins, certain herbal supplements, cold and flu medications. Please keep all of these out of your pet’s reach. Most exposures are accidental but some well-meaning owners think many of these are safe to give their pet. You should always check with your veterinarian prior to giving any OTC medication in your pet. They can tell you which are safe and if your pet is ok to take them and at what dose. Ibuprofen and other human pain medications can be safe for us but deadly for our pets! 1. Human Prescriptions - Pain medications, anti-depressants and heart medications are the most common poisonings. Again most are accidental but some well-meaning owners think these are safe to give their pets. Please keep all of your prescriptions well out of your pet’s reach and ALWAYS ask your veterinarian before giving any medication to your pet. Please remember to keep your pets safe this week and every week this year! And please share this with your friends if you haven't already! If you have any questions we can always be reached at 707-535-9979 or email Dr. Kim at kschmidt@napaholisticvet.com. My Cat Hates the Vet! You can help to make it better. Your cat will NOT look like this at the vet if you follow our plan! Do you dread taking your cat to the veterinarian because it is such a stressful experience for you and your feline friend? We completely understand! Even Dr. Kim has a kitty who gets upset at the veterinary clinic. So she is going to tell you some tips and tricks for making your kitty’s experience at the vet a positive one. Veterinary visits are so important for cats. Yearly visits are especially important in felines because they are excellent at hiding any problem from you. They are biologically designed to hide their problems. So things like tooth infections, intestinal issues, heart disease, arthritis, kidney disease, urinary problems, thyroid disease and lung disease can easily go un-noticed by the most loving and devoted pet parents. 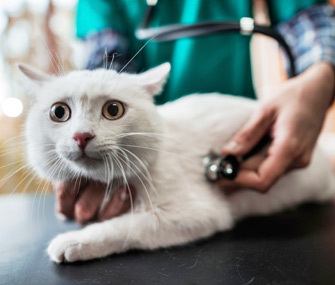 A thorough veterinary exam alone can pick up on so many of these issues in the early stages so we can treat them before they progress to more serious concerns. The bottom line is that you should be taking your kitty to the vet EVERY YEAR to get an exam, period. If your vet finds a problem and your kitty needs other tests like bloodwork, urine or imaging (x-rays, ultrasound) it’s even more important to make sure they are happy at the vet! We want to make sure the visit is calm and serene so keep reading to see what you can do to make it happen! First, you need to understand that when your cat gets upset at the veterinary hospital it’s only because they are scared. When they start to hiss, growl, bite or scratch it’s because they are fearful of being hurt and this is the only way they have to protect themselves. All the ideas we will share with you are designed to take their anxiety away as much as possible. If your kitty arrives happier and the visit is handled in the appropriate way then they won’t need to get upset. It all starts at home. We all know this scenario….your cat has a vet appointment so you bring out THE CARRIER. Then…your cat disappears. This is the first place that you can help. Cats are very smart. They know that the carrier means the vet and the vet is scary. So how can you help? Make the carrier part of everyday life. Dr. Kim keeps her cat’s carrier in her bedroom closet and puts a soft kitty bed inside. She takes the door off so her cats can go in and out and use it as a hiding and resting place. That way when it’s time to take them to the clinic, she can put the door back on and they are actually happy to be in the carrier! This can be done with any carrier but another great product is the Sleepypod® Mobile Pet Bed. It is a pet bed that easily transforms into a carrier and is even crash tested! Watch the video here! If you are using a carrier you should always put something soft in it like a towel or preferably, your kitty’s favorite bed. Make this carrier your kitty's regular bed at home! Vet visits will be a breeze! The next thing you can do is use kitty pheromones. A mother cat secretes this to help her kittens relax and now you can use it to help your kitty relax! Feliway® is our favorite pheromone brand. It can be purchased in a spray or a wipe. The wipes come in individual packages which may be more convenient for a single visit. It is very important that you do not use the wipe directly on your kitty! You should wipe the inside surfaces of the carrier and the pet bed or towel that is placed in the carrier. They can be purchased here . Use these pheromone wipes on the inside of the carrier and pet bed inside it! After you have wiped the carrier with pheromones, put in your cat’s favorite kitty bed (or just change your Sleepypod® into a carrier) then you can actually cover the carrier with a small towel or thin baby blanket. Using a towel cuts down on visual stimuli that may add to your cat’s stress level. If the weather is very warm you should skip this step because you don’t want your kitty to overheat in the carrier. You can even play special music in the car on the way to the vet! Harp music has been shown to soothe animals and decrease stress. The music will also help calm you down so you aren’t as stressed! Dr. Kim thinks Susan Raimond has done lovely work with this and her CDs can be purchased online here . Many other types of music can be found online for this purpose with a quick google search. You can call ahead to the veterinarian to make sure that the doctor is running on time. If the doctor is running a little behind then you can arrive a little later so that you don’t have to wait in the lobby as long. Upon arrival, ask to be placed into an exam room as soon as possible. That way your kitty won’t hear the noises in the lobby or smell the other animals that might be there (dogs!). If you have to wait in the lobby pick a quiet corner away from other people and pets. Once you get into the exam room Dr. Kim recommends leaving your kitty in the carrier until the nurse or doctor comes in. Unless of course your kitty is the social type and would prefer exploring! For most kitties it is much less scary to be in the quiet carrier. Ask the nurse and doctor to do as much of the exam and tests IN THE EXAM ROOM and IN THE CARRIER as possible. With the Sleepypod® and many other carriers you can just take off the top so they don’t have to pull or “dump” your cat out - very stressful! Also, you should ask to be present if possible. Staying with your pet can be soothing for them. However, you should let the nurse and doctor hold your kitty for the exams and tests. You don’t want to risk a bite or scratch if they do happen to get grouchy. This is so important for safety. Many veterinarians are becoming Fear Free® certified. Dr. Kim is in the process now! Those veterinarians will already be employing these low stress handling techniques. They will often use towels to wrap your kitty if bloodwork is needed instead of scruffing your pet. Look for this logo at the veterinary office you choose! The last thing we need to comment on is a medication called gabapentin. If your kitty gets really stressed at the veterinarian despite the above techniques then you should ask your kitty’s doctor to send this home with you and come back a different time. Gabapentin has been proven as a very safe and effective way to decrease stress in cats at the veterinary clinic when given orally (either in a treat or pilled) at home prior to the visit. A great clinical trial was just released and can be found here. Trazodone is another medication that has been used very effectively for this purpose. Ask your vet for this! We hope that these tips and tricks have been helpful for you! As a holistic veterinarian decreasing stress and anxiety is of the utmost importance for Dr. Kim! This will not only help to improve your kitty’s anxiety but also their health and well-being by allowing a calm and serene yearly veterinary visit! Dr. Kim regularly does house calls for acupuncture. These home visits eliminate the stress of the vet clinic but can still make your kitty nervous. Alot of these techniques can be employed at home visits too such as Feliway®, acupuncture in the pet bed and gabapentin if needed! To schedule an appointment please call 707-535-9979 today! 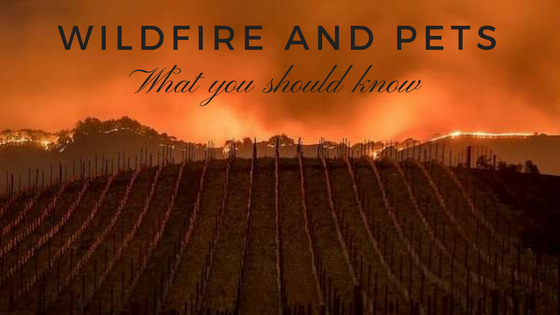 With the recent wildfires in our hometown of Napa, California we wanted to put together an informational guide about your pet’s health risk during and after a wildfire and what the important things are to know. The most important thing that we can stress is to please TAKE ALL OF YOUR PETS WITH YOU DURING AN EVACUATION. If you need to leave your home then so does your pet! A portable water bowl with small bottle of water for travel. Dr. Kim’s other tip for your emergency kit is to include some holistic options to help with your pet’s anxiety. Leaving their home environment and relocating somewhere new can be extremely stressful. We recommend Stress Away Soft Chews by Vet Classics, Rescue Remedy for Pets, Lavender Essential Oil (our favorite brands are Young Living and DoTerra), and Adaptil pheromone spray for dogs or Feliway pheromone spray for cats. If your pet gets extremely anxious with travel you may want to ask your veterinarian for a sedative to have on hand so that you and your pet can both get some needed rest. Also, if you have a dog-aggressive dog you may want to consider having a basket muzzle in case you come into contact with unfamiliar dogs. Please make sure all evacuation orders have lifted from your home before you consider returning. You may want to make sure that your home has power and clean water before re-populating. At the very least please follow any boil water notices for your area so that you are providing your pets with safe drinking water. Just as important as the status of your home is the status of the air quality. Please refer to the Air Quality Index which can be accessed for your zip code at this website. The chart below provides a detailed explanation of what the AQI means. If the AQI is above 151 (unhealthy, very unhealthy or hazardous) then we would recommend keeping your pets out of the area if possible. If people need to be outside during these conditions we can wear a protective N95 mask, but the human masks that exist cannot be manipulated to fit over the snout of a dog properly. So if our pets are outside using the bathroom or taking a walk during these conditions we are putting their health at risk. If you absolutely need to bring your pet back to your home when air quality is poor then hopefully we can offer some helpful tips to keep them as safe as possible. If you are returning to an area that has been badly burned consider leaving your pets with a friend, neighbor or boarding facility during cleanup as there are numerous hazards that they could be exposed to including sharp objects and toxic chemicals. Wildfire smoke is a mixture of gases and fine particles from burning trees and other plant material. The gases and fine particles can be dangerous if inhaled. The particulate matter (also called “PM”) in wildfire smoke poses the biggest risk to the public’s health. The potential health effects vary based on the type of plants burning, atmospheric conditions and, most importantly, the size of the particles. Particles larger than 10 micrometers usually irritate only the eyes, nose and throat. Fine particles 2.5 micrometers or smaller (PM2.5) can be inhaled into the deepest part of the lungs, and may cause greatest health concern. If you have a very young pet, elderly pet, or a pet with a heart or lung condition (congestive heart failure, chronic bronchitis, asthma, pneumonia) then your pet will be particularly at risk to the effects of smoke exposure. Birds are also extremely sensitive to the effects of wildfire smoke and should be kept indoors at all times. What you need to know is that what affects you affects your pet and the measures you take to protect yourself are the same measures you should take to protect your pet. Dogs and cats lungs are very similar to our own. Keep your pets indoors as much as possible (limit dog walks to potty breaks only and if you have outdoor cats keep them inside). Provide plenty of fresh water (boil water if instructed to do so). Avoid smoking tobacco, using wood-burning stoves or fireplaces, burning candles, incenses or vacuuming which can all further contribute to indoor air pollution after a wildfire event. After being outdoors, wipe down your pet’s coat and paws with a fresh water cloth in order to remove particulate matter and prevent them from ingesting it while grooming. Run a humidifier to help moisten the air and loosen respiratory secretions. Make sure to wear your N95 mask when taking your pets out to use the restroom! Dogs and cats are most at risk for developing eye and lung problems after exposure to wildfire smoke. Mild eye irritation, mild clear nasal discharge and mild sneezing are common with wildfire exposure. You can help lessen these signs by following the recommendations above. Also, to help with eye irritation you can purchase over the counter eye lubricants such as Genteal Lubricant Eye Gel or Artificial Tears Lubricant Eye Drops and use them on your pet frequently throughout the day (every 2-4 hours). If you notice any of the following signs please contact your family veterinarian as it could indicate a more serious eye or respiratory issue that may require additional treatment. Keeping the indoor air clean and limiting outdoor exposure during poor air quality conditions is of utmost importance for your animal’s health. In addition there are other holistic options to help with wildfire smoke exposure including herbs, supplements, antioxidant and immune support. Marshmallow and licorice are two common herbs that can help to soothe the respiratory tract. Some other products we recommend for our patients from the Standard Process line include Emphaplex and Pneumotrophin PMG. Thorne Mycoimmune and Stamets7 Daily Immune Support are two mushroom blends that Dr. Kim uses with her patients for general immune support. For antioxidant support we recommend Cell Advance 880 or Vet Classics Canine Antioxidant Support. All herbs and supplements for respiratory support should only be used under the direct supervision of your holistic veterinarian. For more information or to schedule a consultation with Dr. Kim for a specific respiratory support plan for your pet please contact us at kschmidt@napaholisticvet.com or call 707-535-9979. Arthritis is a very common condition in pets, but the pain arthritis can cause is often overlooked by families or misinterpreted as their pet “just slowing down” as they age. The underlying disease process is slightly different in dogs (Osteoarthritis) and cats (Degenerative Joint Disease), but both species very commonly show clinical signs related to the pain of arthritis as they age. These signs are often subtle since pets very rarely cry or groan in pain. Many families expect that they will easily recognize pain, but animals are instinctively very good at masking their discomfort. Often pain could manifest as simple behavior changes such as refusing to go up the stairs, declining to jump on a couch or countertop, unwillingness to groom themselves, or staying seated instead of following family members around the house. Luckily there are many therapies we can use to control the pain associated with arthritis. Sometimes, though, the multitude of treatment options and wealth of information available on the internet can be overwhelming for families. With that in mind, we have created this worksheet to help guide pet families as they approach their pet’s arthritis pain management plan. Utilizing the difference approaches allows families to utilize multi-modal pain management strategies to keep their pet as pain-free as possible for as long as possible. Weight Management: One of the most beneficial things pet families can do to guard against the pain of arthritis is to keep their pets lean throughout their life. Studies have shown that 80% of labrador retrievers develop osteoarthritis when fed generous calorie meals. However, when their study counterparts were fed a reduced-calorie diet, only 50% of those labrador retrievers developed osteoarthritis. This highlights the difference monitoring weight and calorie intake can have on a pet’s longterm health and comfort. The labs in these studies who were fed the restricted calorie diets also lived 1 to 1.5 years longer than the free fed labs. Ask your veterinarian to discuss your pet’s ideal weight and make sure to monitor their body condition score throughout their lives. An ideal body condition based on the chart below would be 4-5/9 or 2.5-3/5 depending on the point system being used. EPA Rich Diet: Diets high in Omega-3 fatty acids supply the body with building blocks that help regulate the amount of inflammatory mediators in the body. The most helpful building block is Eicosapentaenoic acid ( or EPA), which is a type of Omega-3 fatty acid. EPA can be incorporated into the diet by adding a high quality fish oil (our preference) or by switching to a diet that has higher levels of EPA. We recommend both Grizzly and Kronch salmon oil at Napa Holistic Vet. The dose of EPA will be appropriate for your pet's arthritis if you follow the dose on the label. If changing to an EPA rich diet be somewhat wary of general “fish oil” or “fatty acid” claims as you want the diet to contain >2% Omega-3 Fatty Acids and specifically mention EPA to be most beneficial. Omega-6 fatty acids do not provide the same type of joint inflammation protection. These increased EPA levels can be found in prescription diets as well as some over the counter diets. Examples of EPA rich diets include: Hills J/D, Purina Pro Plan JM, Iams Joint Plus, Royal Canin Mobility Support, Orijen Senior, Dogswell Happy Hips. Victor Performance/Joint, Now Fresh, Merrick Grain Free Healthy Weight, Fromm Gold Weigh Management, Earthborn Weight Control, Earthborn Coastal Catch, Annamaet Grain Free Lean, and Nature’s Variety Instinct Healthy Weight. Make sure to evaluate your pet’s food for the AAFCO label and review the Guaranteed Analysis section to ensure it contains these ingredients. Chondroprotectants: Chondroprotectants include Glucosamine, Chondroitin, and Avocado Soybean Unsoponafiables (ASUs). Some of the products we recommend include Dasuquin, which provides all three chondroprotectants listed above, Adequan, ArthriEase Gold and Standard Process’ Flex Support. Dasuquin is one of the only products including ASUs, which makes it one of the most beneficial chondroprotectants available to pets. Dasuquin Advanced is a newer product which also includes boswellia (frankincense) and curcumin extracts in addition to ASUs. Many other glucosamine/chondroitin products are available, but please keep in mind these products are not regulated by the FDA and in many cases you do get what you pay for. Studies evaluating glucosamine products have shown that when products cost under $1 per day, that less than 10%actually contained the amount of glucosamine that their label claimed. Using products that your veterinarian trusts will ensure you are not using products with no benefit to your pet. The good news is that often after being on chondroprotectants for 4-6 weeks, you may be able to decrease your pet’s medication dose by 25% – saving you money on their medication costs instead of their chondroprotectant cost. nSAIDs: Non steroidal anti inflammatories are the mainstay of medical treatment for arthritis pain in dogs. These medications treat the inflammation that is at the root of arthritis pain. Commonly prescribed nSAIDs include carprofen (Rimadyl, Truprofen, etc), deracoxib (Deramaxx), meloxicam (Metacam), and firocoxib (Previcox), among others. These medications are often invaluable in breaking the pain cycle for pets with arthritis and while we attempt to use the minimum effective dose, many pet families are reluctant to give these medications for fear of liver or kidney damage or GI upset. While these concerns are valid, simple monitoring with routine blood work and treatment with anti-oxidants to support the liver can alleviate many of these concerns, while allowing us to keep a pet comfortable. There is also a new NSAID on the market for dogs called Galliprant that is safer for the kidneys and liver if your pet has a pre-existing condition with these organs. Cats are much more sensitive to NSAIDs. Meloxicam is often used off-label in cats at low doses and like any NSAID, should always be done so under the supervision of your veterinarian. Nutraceuticals/Supplements: Other dietary supplements are available that support joint and general muscle-skeletal strength. We often use Standard Process’ Musculoskeletal Support with good results. Standard Process’ Whole Body Support is another that we will commonly use in our geriatric patients as a foundation for good overall health. Many people have reported improvement by using Golden Paste a tumeric formulation that can have anti-inflammatory benefits. Another product we recommend is CurcuVET-SA50, which uses the active component of turmeric called curcumin. This often is more simple for pet owners who do not wish to make their own golden paste. Essential oils can also be extremely helpful for pain and discomfort! We recommend both individual oils and blends from Young Living® And DoTerra® that include but are not limited to copaiba, frankincense, helichrysm, wintergreen and peppermint. Please always consult with your holistic veterinarian prior to starting an essential oil regimen for your pet! Adjunctive Therapies: There are several other therapies that can be utilized for pets with arthritis and degenerative joint disease. Cold laser therapy can be very beneficial in reducing inflammation. At Napa Holistic Vet we offer both in-home cold laser treatments as well as cold laser rental for clients who wish to treat their pets themselves in the comfort of their own home. Stem/Regenerative Cell Therapy is a process which involves harvesting a small amount of adipose (fat) tissue from a dog, using a laboratory to process and localize the stem cells present in that tissue, and then injecting the processed solution back into the dog (usually via an IV or directly into the affected joints). We do not currently offer this therapy, however make sure to check with your regular veterinarian because more and more clinics are starting to offer this service. Environmental modification such as using ramps, using yoga mats or “puzzle pieces” for traction control, and using Toe Grips and PawFriction can also help older pets have more control of their footing and minimize sliding or falling on slick floors. Acupuncture is a very beneficial treatment for pets with arthritis pain and can make a significant difference in the comfort and mobility of geriatric pets. Learn even more about acupuncture for pets on our website! Adjunctive Medications: Many times as the pain from arthritis progresses, the nSAID being utilized is not enough to control the pet’s pain. Utilizing multiple medications that each have different ways of interrupting the body’s inflammatory and pain responses can make a big difference in your pet’s overall comfort. Commonly used adjunctive medications for arthritis pain control can include Chinese Herbal medications, Gabapentin, Amantadine, and Tramadol. Occasionally Acetaminophen (Tylenol®) can be used for painful conditions in dogs but is not recommend with pre-existing liver disease. It is important to note that Tylenol® is high toxic (deadly) to cats so careful discussion with your veterinarian prior to administering this medication is required! Physical Therapy: Physical Therapy is often considered for people with joint and mobility concerns, but is not as often prescribed for pets, although it can be just as beneficial. There are several very simple exercises that families can do with their pets to encourage muscle use and flexibility. Massage is also beneficial to pets and can be a nice bonding experience for the pet and their caretakers. Speak with your veterinarian about which exercises they recommend for your pets. If your pet is showing clinical signs related to arthritis changes, please contact Napa Valley Holistic Veterinary Services at 707-535-9979 to schedule an evaluation to discuss which recommendations might be best for your pet.